Little, Brown Spark, 9780316438063, 304pp. Like most Americans at the time, Plennie Wingo was hit hard by the effects of the Great Depression. When the bank foreclosed on his small restaurant in Abilene, he found himself suddenly penniless with nowhere left to turn. After months of struggling to feed his family on wages he earned digging ditches in the Texas sun, Plennie decided it was time to do something extraordinary -- something to resurrect the spirit of adventure and optimism he felt he'd lost. He decided to walk around the world -- backwards. 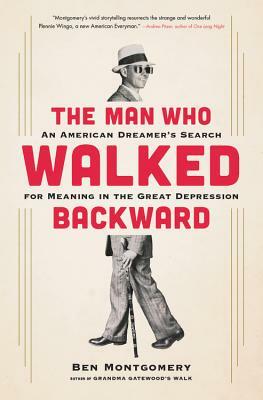 In The Man Who Walked Backward, Pulitzer Prize finalist Ben Montgomery charts Plennie's backwards trek across the America that gave rise to Woody Guthrie, John Steinbeck, and the New Deal. With the Dust Bowl and Great Depression as a backdrop, Montgomery follows Plennie across the Atlantic through Germany, Turkey, and beyond, and details the daring physical feats, grueling hardships, comical misadventures, and hostile foreign police he encountered along the way. A remarkable and quirky slice of Americana, The Man Who Walked Backward paints a rich and vibrant portrait of a jaw-dropping period of history. Ben Montgomery is a former enterprise reporter for the Tampa Bay Times and founder of the narrative journalism website Gangrey.com. In 2010, he was a finalist for the Pulitzer Prize in local reporting and won the Dart Award and Casey Medal for a series called "For Their Own Good," about abuse at Florida's oldest reform school. He lives in Tampa with his three children. He is the author of Grandma Gatewood's Walk.